Around ten percent of Cambodian children do not live past their first year due to the direct effect of diseases spread via contaminated water sources, such as diarrhea and cholera. The Water and Healthcare Foundation (WAH) seeks to improve this situation. Its goal is to improve the living conditions of rural communities in Cambodia – with a priority on children and their families. Operating in the central province Kampong Chnnang, WAH aims to provide access to safe drinking water to all schools in the province and some selected other locations, generating a far-reaching social impact as medical bills decrease, student attendance rates rise, and children exhibit better health all around. This video illustrates the importance of clean water, as well as the scope of WAH’s work. The Marshall Foundation is a proud supporter of WAH since early 2015. Extending beyond financial support, the Foundation is sponsoring the installation of water pumps at over 50 schools. In 2015 alone, pumps were installed at 29 schools, providing a total of 8,454 children with access to clean water. A variant of the conventional water pump is the bicycle-powered pump, which offers an innovative and environmentally-friendly solution to the water problem. By using pedal power, the pumps draw water from underground wells directly through a 0.01 micron filter to eliminate water-borne bacteria. Each pump allows a ten-year old child to extract up to 500 litres of safe drinking water per hour, without needing electricity! It is a solution that is simple, green and uniquely home-developed. You can see how it works here. The bicycle-powered pumps are only the beginning. The installation of these systems has paved the way for further initiatives by WAH, such as the “Happy Hands” and “Happy Teeth” campaigns, which promote the importance of hand cleanliness and dental hygiene amongst the children. The children also carry home clean drinking water with them in PBA-free plastic bottles. This way they can enjoy safe water during the entire day and their family members also profit from the school’s clean water supply. The efforts of WAH have achieved significant results. The number of illnesses caused by unsanitary water sources has decreased significantly – a doctor from a village near Tonlé Sap River even reported an 80% drop in water-related stomach ailments since the installation of WAH’s filtered water pumps. 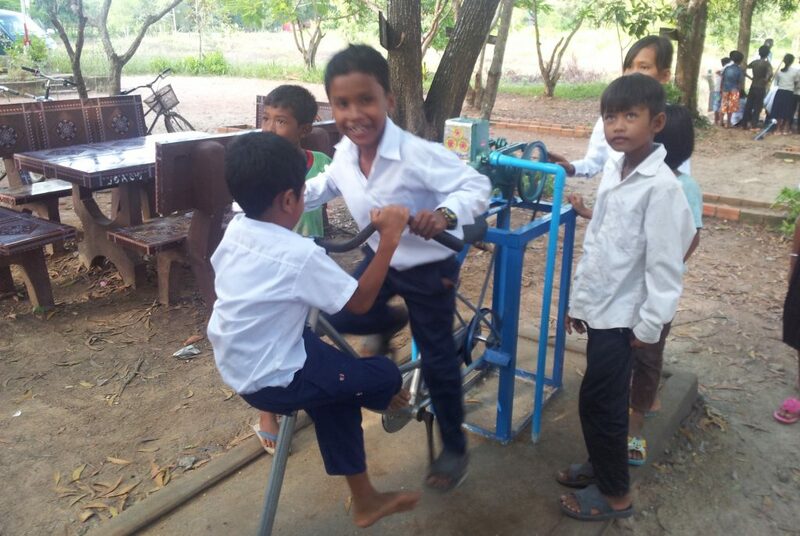 Since 2010, WAH’s extensive water projects have impacted approximately 200,000 people in 24 villages and 157 schools, while also ensuring the availability of clean water for all 3 hospitals and 41 health centres in the Kampong Chhnang province. Besides its water projects, WAH also branches into pediatric healthcare and has even spearheaded a hospital midwife and pediatric training initiative with KK women’s and children’s hospital from Singapore, which started in 2013. They have run training programs for over 200 local midwives covering birthing methods and emergency practices. This year there will be 2 pediatric training programs, training up to 80 pediatric nurses and doctors. The Marshall Foundation is proud to work with WAH – its gift of clean water will prove, in the long term, to be gift that keeps on giving.